The figure above is the best evidence we have of a planet smaller than Mercury orbiting another star. It is taken from the a paper published in Nature this month. While it might not look that impressive, let me explain why it is. The data from this image represents measurements in brightness of the star known as Kepler 37 over a period of 978 days. Kepler 37 is a sun-like (G-type) star with about 4/5 the mass of our Sun. It’s a bit older than our Sun and is about 215 light years away. This particular planet was discovered by the transit method. It turns out that at least three of the planets orbiting this star are lined up so they regularly pass in front of the star from our vantage point, known as transiting. When the planet transits the star, the star appears slightly darker since the planet blocks some of the light. This is a very small decrease. If you look on the graph, you can see this particular planet dims the star by only 20 millionths of its average brightness. This decrease is so small that it is smaller than random fluctuations in the measured brightness (known as speckle). To find a planet, you have to measure the star’s brightness over years (about 2.6 years in this case) to see if you can find a dimming that occurs regularly. In this case, there was a small dimming about every 13.4 days. Once you find a recurring pattern, you then have to see if it is a planet, since it could just be a random fluke, or something like sunspots on the star. Which brings us back to our figure. The black dots on the graph represent measurements of brightness lined up with the orbital period of the possible planet. Since the data were taken over 978 days, and the orbital period is 13.4 days, this represents an observation of more than 70 transits of the planet. From all these measurements, you can take a statistical average, which is what the blue dots represent. This average is then fit to a theoretical model of a transiting planet, which is the red line. 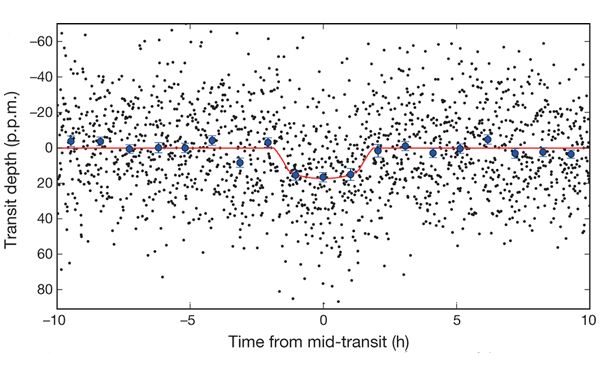 As you can see, the average and the red line fit really well, so it is clear that we’ve detected a planet. The model fit is actually rather complex. The exact shape of the red line depends on things like how the planet’s orbit is oriented relative to us (its inclination) and the diameter of the planet relative to the diameter of the star, so the best fit gives us a measurement of its size relative to Kepler 37. This is where the research gets interesting. The team actually found three observed planets orbiting Kepler 37. From their orbits and the star’s brightness and color, we have a really good determination of the star’s mass. But how do you measure the size of the star? After all, it is light years away, so it looks pretty much like a point of light. 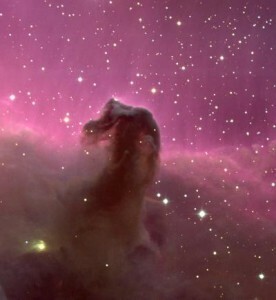 It turns out that stars are not static but can oscillate a bit like a ringing bell. Just as bells made of different materials give different tones, stars of different densities “ring” with different tones. The team was able to measure these vibrations in the star, which let them determine the density of the star. Knowing the mass and density of Kepler 37, we can then determine the size of the star accurately. It turns out to be about 77% of the Sun’s diameter. But remember that the red curve tells us the size of the planet relative to Kepler 37. So by listening to the ringing of the star, we know that this particular planet has a diameter between 4,540 – 2,930 km, with our best estimate being 3,865 km. This means the planet is smaller than Mercury (4,880 km), and it might even be smaller than the moon (3,474 km), though it is probably between the two. What’s amazing about this kind of work is that we know the planet exists, and even know its size without ever observing the planet directly. We don’t need a photograph of the planet to prove it exists; we simply need to watch closely for its effect on starlight.